Interest in renewable energy continues to grow in Minnesota. In fact, state money for one form of solar rebate is already used up, but there's still money available for a different system, one that's considered more efficient at converting the sun's rays into energy we can use. People have used the sun to warm themselves forever -- we can all appreciate a south-facing window in the winter -- but new technologies use solar energy far more efficiently. Typical photovoltaic panels only convert about 15 percent of the sun's potential energy into electric power. 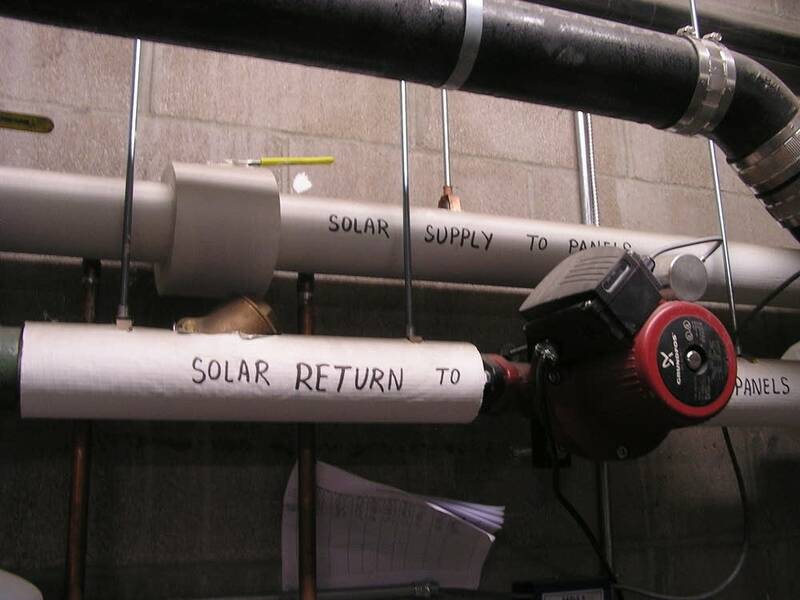 Solar thermal systems are much more efficient, like 50-to-60-percent efficient. On the roof of an apartment building at the corner of Franklin and Portland Avenues in Minneapolis, 24 panels face the sun. "There's a great view of downtown from up here," says Will Delaney with Hope Community, the non-profit group that built the Wellstone building. The panels are designed to provide about half the energy needed to heat water for showers, dishwashers and so on in the 29 apartments. They've only been connected since November, and since there's less sunshine in the winter, Delaney says so far they've only supplied -- on average -- about a quarter of the energy needed for hot water here. "There are so many variables to how a system like this works: everything from how sunny it is in a given year, how many days of rain, how many people are in the building, how much water they're using," Delaney said. "But overall I'd say even at 25 percent we're still very happy with the system because that's 25 percent that we're not having to pay for out of the gas." The collectors consist of a sheet of tempered glass covering a copper heat absorber. A fluid similar to antifreeze runs through the absorber. Once the fluid is heated up, it's pumped to a heat exchanger in the basement. The heat exchanger is a box the size of a microwave oven. Here the heated fluid warms up the water. "Basically the water needs to be about 120 degrees when it goes up to the apartments, so in the morning now, it's already up to 100 degrees in the solar tanks, which means it only needs an additional 20 degrees through the gas system to be ready to go throughout the units," Delaney says. Delaney figures the water comes into the building from city pipes at about 40 or 50 degrees. So the solar system does most of the work. The system is made by Alexandria-based Solar Skies. It's also possible to heat rooms with solar thermal. Jason Edens directs the Rural Renewable Energy Alliance, a non-profit group that builds and installs space-heating solar thermal systems. Edens says it all depends on the site, but they usually aim to cover about one-quarter of the heat load of a home. "That doesn't sound like a great deal perhaps, but we have to remember that at this latitude, most homes and buildings at this latitude devote about 50 to 60 percent of all the energy they use for space heat. So a quarter of the heating season's heat load is actually a substantial amount of energy and represents substantial carbon savings and financial savings," he says. The systems are usually mounted on a south wall, and they use forced air to heat the adjacent room. Solar thermal systems typically cost between $6,000 and $12,000, installed. The federal government offers a 30-percent tax credit, and the state has a rebate program for 25 percent of the cost, up to $2,000. There's another program for businesses. The payback time for solar thermal can be as little as four years, depending on the situation. 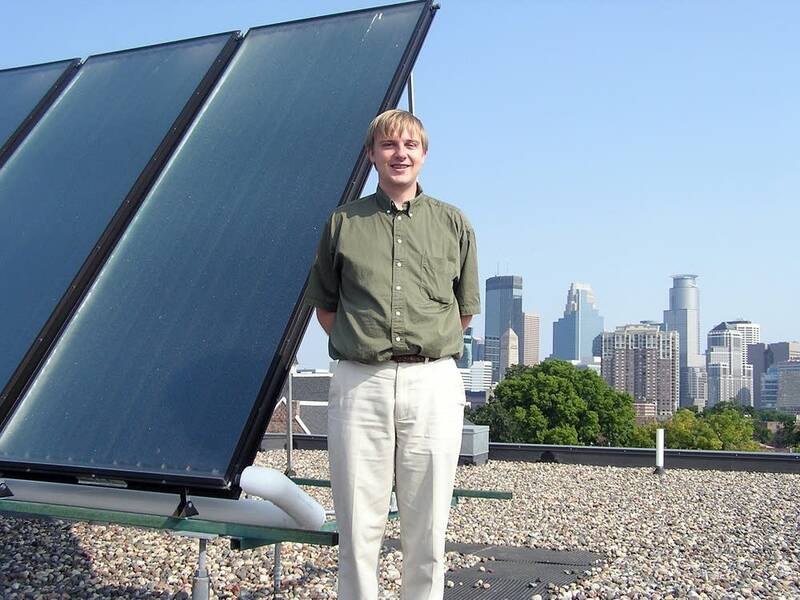 And for people in Minneapolis and St. Paul, there's another incentive: The Minnesota Renewable Energy Society is organizing a bulk purchase of solar hot water systems, and they're scheduling installations geographically for more savings. More than a dozen Minnesota companies manufacture parts or whole solar systems. The state wants to help them grow -- that's one reason for the rebates.